Streets of Washington, written by John DeFerrari, covers some of DC’s most interesting buildings and history. John is also the author of Lost Washington DC. 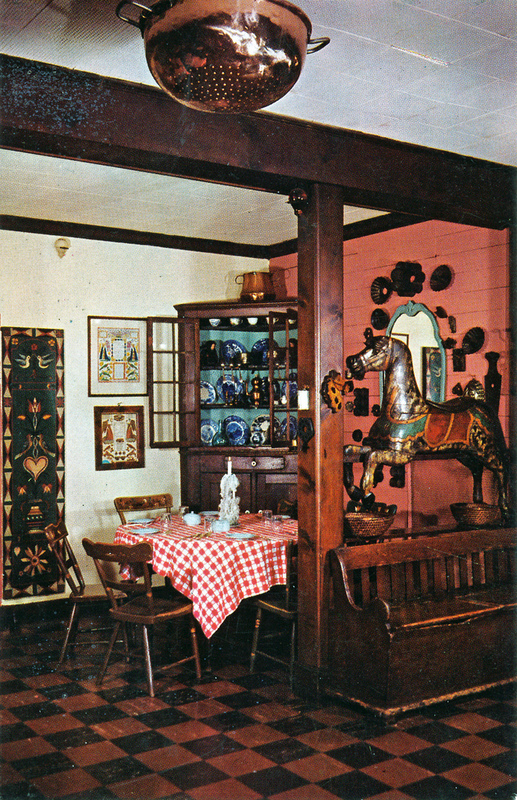 Interior of the Water Gate Inn (author’s collection). One of the most distinctive restaurateurs of 20th century Washington was Marjory Hendricks (1896-1978), owner of the Water Gate Inn, which she operated from 1942 to 1966 on the current site of the John F. Kennedy Center for the Performing Arts. Like all great restaurateurs, Hendricks knew how to keep her guests charmed and entertained, and her Pennsylvania Dutch-inspired eatery was unique in Washington history. Born in Seattle, Hendricks came to the D.C. area with her family in 1918. After a brief first marriage and early restaurant experience in Reno, Nevada, Hendricks traveled to France in 1929 to study cooking. 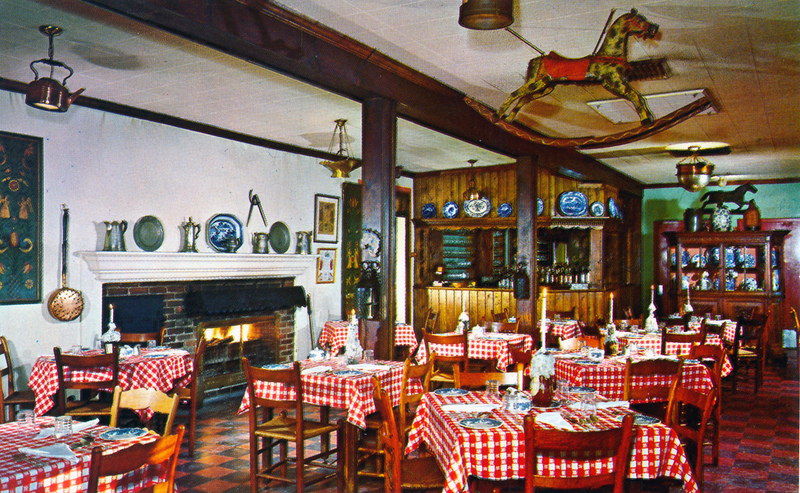 On her return in 1931, she acquired a failing country club in Rockville, Maryland, which she turned into the Normandy Farm restaurant, a rustic inn of the type that were very popular in the era. The restaurant remains in business today, its name spelled slightly differently. Eleanor Roosevelt was among the Washingtonians who discovered Normandy Farm, and she is said to have encouraged Hendricks to open a “branch” restaurant in D.C. In 1941 Hendricks bought the former Riverside Riding Academy at 2700 F Street NW as the site for her new in-town eatery. The location was something of a gamble: the Foggy Bottom neighborhood was a semi-industrial backwater at the time. Some even called it a slum. It was far away from most of the city’s established nightlife, although across the street stood another former riding facility that had been turned into a supper club, The Stables. Nevertheless, with the tremendous influx of newcomers to the city at the beginning of World War II, existing restaurant facilities—particularly for large groups—were inadequate, and a talented restaurateur like Hendricks was in high demand wherever she might choose to set up shop. Wartime materials shortages kept her from opening the new place until August 1942, after which it soon became a hit with local diners. For her new venture, Hendricks decided to adopt a Pennsylvania Dutch motif, reflecting growing interest in the culture and its artifacts. 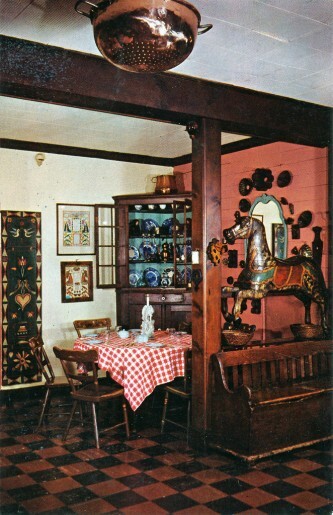 Her sister, Genevieve Hendricks (1893-1976), a well-known interior designer, was in charge of decorating the new space with Pennsylvania antiques, including a number of old hobbyhorses, which became emblematic of the new restaurant. Large windows offered an enchanting view of the Potomac River, and the quaint décor gracing the former stables’ heavy wooden carpentry lent a cozy, rustic atmosphere to the restaurant, which customers found very appealing. 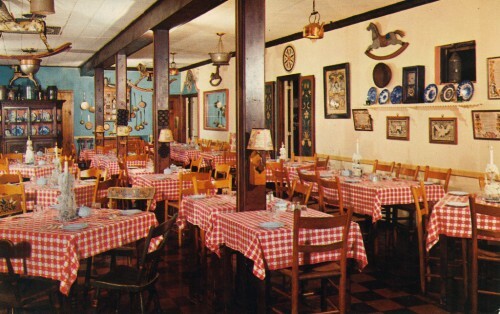 For many of the authentic Pennsylvania Dutch dishes offered at the Water Gate, Hendricks relied on Flora G. Orr (1893-1953), a long-time friend and culinary consultant who developed recipes and trained the kitchen staff. 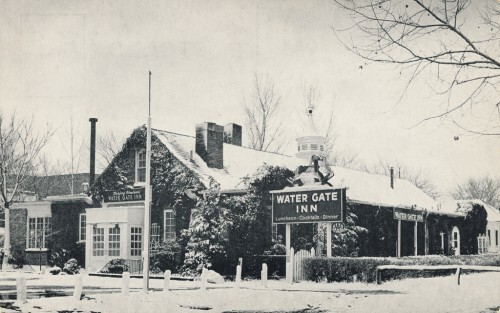 Several Water Gate Inn dishes were consistently singled out by critics and customers alike as especially memorable, including the popovers, which had first been introduced at the Normandy Inn. The inn’s menus would usually list a traditional dish, such as the unpronounceable “Sigh Flaysch Rick Mays El mit Rode Graut” (pork tenderloin cooked with red cabbage) or the popular “Shrimp Wiggle Esche Puddle” (shrimp and peas in cream sauce). Other dishes included traditional pork-and-sauerkraut recipes, layered dishes called Gumbis (shredded cabbage with layers of fruit and/or meat), as well as new recipes inspired by traditional Pennsylvania Dutch techniques. One dish, Chicken Barbara (battered chicken breasts with cream sauce), was so successful that Hendricks trademarked the name. The dish, she claimed, was an impromptu concoction invented for a finicky customer and named after his girlfriend. In 1960 the restaurant was first threatened by plans for the new National Cultural Center, which would become the Kennedy Center. While the inn was not directly in the footprint of the proposed center, architect Edward Durrell Stone felt that additional green space was needed around the center, which would necessitate removal of the inn. Hendricks fought back, urging her patrons to write their congressmen to protest the plan. “This product of private enterprise, the culmination of the owner’s thirty years in the distinctive restaurant business, and means of livelihood of ninety employees, would be destroyed,” she warned. The restaurant stayed open until 1966, when Hendricks finally reached an agreement with the government on the sale of the property, reportedly for $650,000, significantly less than the $1 million she had hoped for. With bulldozers already rumbling all around it, the inn closed in May. “No more Dutch noodle soup, piping hot popovers with melting butter, rich Mennonite chicken, oven-baked loin of veal with Pennsylvania egg noodles, fresh yellow squash, bread-and-butter pickles and apple-tart pies,” the Evening Star’s John Rosson lamented. Hendricks at first thought she might open a new restaurant, and she had purchased the old Childs Restaurant at 2 Massachusetts Avenue NW in 1961 with that in mind. The new restaurant never materialized, and Hendricks instead ran the Renaissance Gift Shop in the space for several years. By the time the Water Gate Inn closed she went into full retirement. Hendricks died in 1978. Illustrations are all from postcards in the author’s collection. A version of this article will be included in the forthcoming book, Landmark Restaurants of Washington, D.C., to be published by History Press. A publication date has not yet been set.